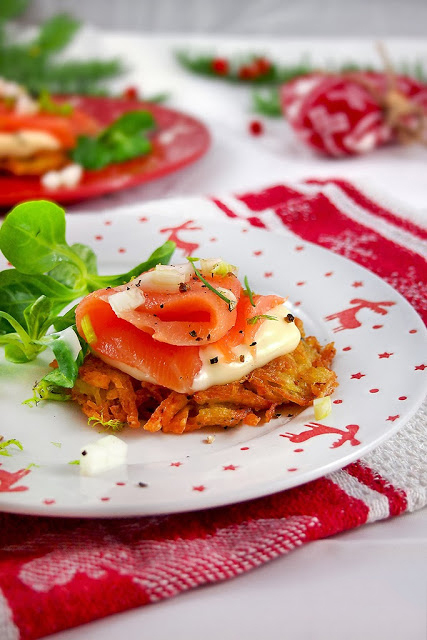 First of all, we offer you an elegant starter of salmon on a sweet potato home-made, served with cream mustard. It is appropriate to make more fish and keep it in a refrigerator. 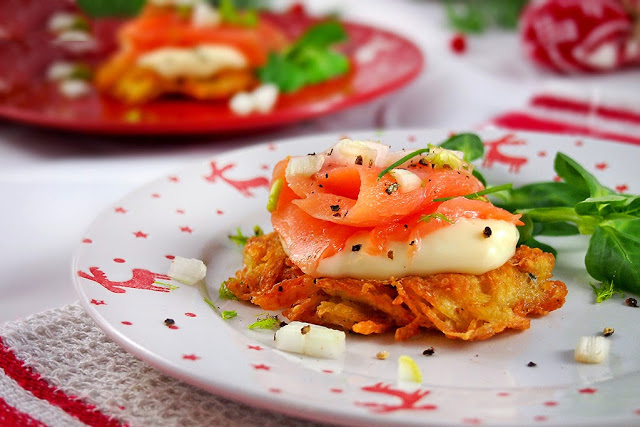 You will also have fresh tasty salmon on hand for a variety of appetizers. Besides, I hope you will like this recipe and you will diversify your meal. Wash the piece of fish and dry it with a kitchen napkin. Do not remove the skin. It will keep the fillet whole, and then it will be easier for you to cut it into thin pieces. Lubricate it on the side without skin with gin and lemon juice. Mix the salt, sugar, chopped fennel and lemon peel. Sprinkle the salmon evenly from all sides. 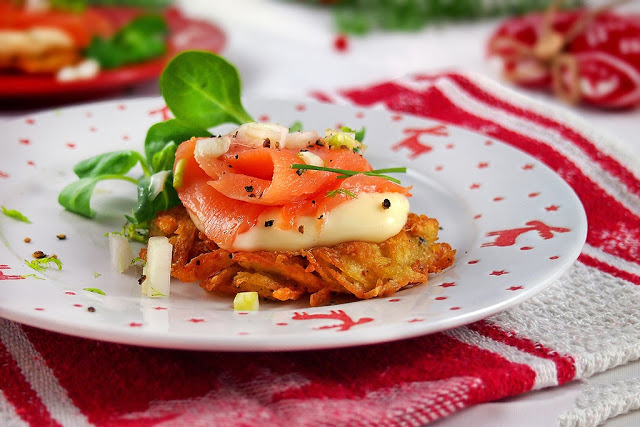 Salmon on potato and mustard, delicious appetizer for four people. h in a box or other container and cover with a nylon foil. Leave it in the refrigerator for 36 hours, and then turn the pieces once to allow the meat to digest evenly. Rinse the fish under cold water and dry with a kitchen napkin. Keep it closed in a box in a refrigerator. Scrape one potato into a large grater, the other one finely. Sprinkle and squeeze out the drained water with your hands. Mix the potatoes with the egg, pepper with pepper and stir. Heat the medium heat olive oil. With a spoon, sprinkle the potato mixture and form small sofas. Go to gold on both sides. It is okay to make the pot weaker so that the potatoes can be fried well and not burnt and burnt. Stir cream, wasabi and salt. If desired, add lemon juice. You can replace mustard with horseradish and cream with mayonnaise. With a very sharp knife, cut thin fillets from the fish. Serve them on the potato sofas with a spoonful of sauce. Top sprinkle with fine cubes a fennel. Enjoy!